An organic cotton baby comforter in baby blue stripes. This makes an ideal baby toy as it's made from soft organic cotton and is machine washable. There are many experts that believe babies sleep better when they have a comforter, as they feel safe and more relaxed when they have their special toy with them Lots of babies naturally adopt a beloved and special toy which they carry with them during the day and which then goes in to the cot at night time to help them sleep. When choosing a comforter for your baby make sure that it is cotton as this is a breathable fabric and also machine washable which is particularly important if it is to be your baby’s constant companion. Also make sure that it is not a beanie stuffed with small parts which could come out if split. PLEASE NOTE. Our comforters are made using organic fabrics left over from the manufacture of baby clothes. We are only able to buy limited quantities of a design so typically each of our baby comforters will sell out within 6 months. If your baby becomes attached and you feel you may need a spare please don’t wait as they do sell out quicky! Our comforters are 100% organic cotton, including the stuffing which is also 100% organic cotton. They are 20cm x 24cm which is a perfect comforter size - small enough to be safe but large enough to be a gripped and carried and gripped. Handmade, fair trade and 100% organic Egyptian cotton. Machine washable. These baby comforters are upcycled from the manufacture of organic baby clothes - nothing is wasted. Suitable from birth. Machine washable. All Under the Nile toys are handmade so sizes can vary significantly. Dimensions are given as a guide only. Who made my baby comforter? 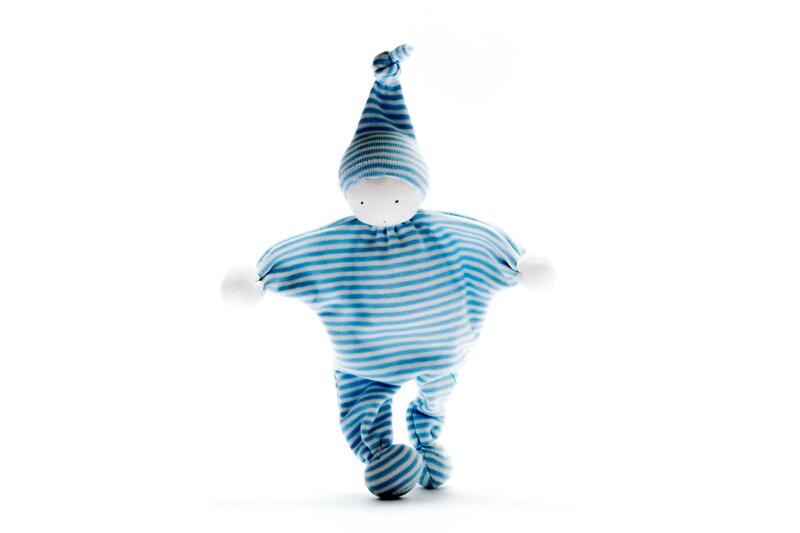 Our organic cotton baby buddies are made by our fair trade partner Under the Nile.